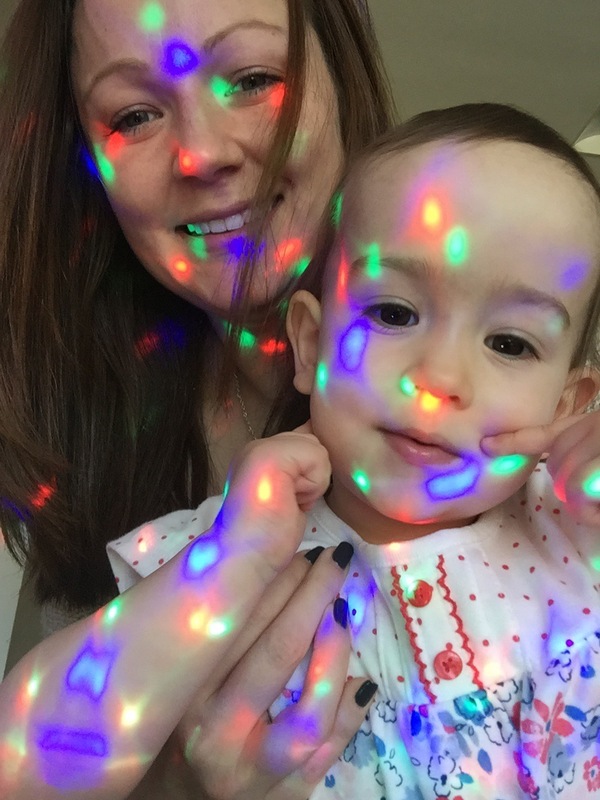 I have suffered with post natal depression before (and written about it here), and the difference between my experiences then and more recently have been vast. Many of the feelings and symptoms were the same, but my response, now I can look back on it a bit, has been very different. Last time I wanted to hide it, and wasn’t even clear about what ‘it’ was. I refused medication, talked to no one and bumbled on. This time around I knew I had to handle it differently, and even at my lowest felt strong enough to open up and do that. In this post I want to talk about some of the things that have made the most difference to me in moving forward. My actions have been very simple and not in any way new or ground breaking, but the positive impact of some of these things has been quite profound. Knowing what you should be doing and actually doing it can sometimes be worlds apart, but the effects of making the effort can’t be ignored. First up, I took the anti-depressants. It took a while to notice any impact because initially my dose was a bit low and they take a few weeks to kick in anyway, but I ignored the stigma of ‘giving in’ and took them. About five weeks after I started a close relative became very ill and my life became a merry-go-round of hospital visits, trips to collect belongings, making necessary calls, arranging care for Millie so she wasn’t in the hospital with me every day and various other things. I quickly realised that handling all this would have been impossible for me to comprehend a short time before, but all of a sudden I was behaving more like myself again. Thank you medical science. Second most important factor; I talked. I referred myself to an NHS talking therapies service and did an online course in depression and anxiety (which I didn’t feel made any great impact) before being recommended for some face to face sessions, which I’m still having now and have been hugely beneficial. I’ve been asked about every aspect of my life from childhood to now, and considered things I would never have dreamed had an effect on my thought processes or behaviours as an adult. Not all of it is linked but to have the space to sit in a room for an hour and talk really honestly through these things has been…uplifting. We spent so much time just going about our business that we never give ourselves space to reflect and talk through our memories or thoughts, and just organise them properly. I’ve also been talking to friends and family. Not always in detail, but just the decision that I was going to talk to people full stop was a big one. Initially I told some close friends and my immediate family, and just to know they were there if I needed them and I wasn’t alone was like a light in the corner of my dark attic of a mind. There are a few that I’ve really opened up to at times, and always walked away feeling so much lighter. There aren’t answers to everything, which is often hard to accept, but just to speak openly without having to have a resolution is very freeing. Talking about your feelings is such a simple concept, and so easy to tell someone to do, but the reality is so different. It’s like the ‘too difficult’ imaginary box I have at work, that I put a task in when I don’t want to face it, and yet when I get to doing it it’s always easier than I expected. The day I told my dad why I was off work it took me about two hours in his company of thinking the words but not saying them, opening my mouth and nothing coming out. I felt stupid, but he just said ‘that’s good you’re taking some time’ and made lots of offers to help out and ease the pressure on me. It’s a work up, but seriously just tell someone, anyone, when you’re struggling. It’s worth it! I was initially signed off work for three weeks, and the thought was horrendous, but in the end I was off for almost three months. Once I had gotten used to being away from the office the idea of going back and returning to having so much more to think about every day made me very anxious, so I needed extra time to deal with that. I started out doing things I thought were therapeutic or worthwhile activities; I got my nails done, I tackled a couple of projects at home, I caught up with friends – I kept busy. But that’s the opposite of what I needed. A very clever friend told me to ‘find the quiet’, and she was spot on. I slowly realised that doing more was actually my problem. I can’t say I ever managed it well, but I tried to make time to slow down and do nothing. Lay down, sit outside, watch mindless TV, anything that required zero brain activity. It’s definitely a skill to be able to create quiet space in your day, but I’m getting it, and it’s bloody lovely. It frees my mind when the crap starts to build up, and I’m then much more able to move forward with the rest of my day. I didn’t see a value in doing something that wasn’t on my never ending to do list before, but now I do. If I spend an entire day visiting friends and family, having fun with Millie, reading and relaxing without doing any housework, it’s fine. Tomorrow is another day. My outlook now is much more positive. The last few weeks I’ve felt brilliant to be honest, and I’m kind of waiting for the bubble to burst, but equally I’m determined to keep it going. I can feel when things stress me out, and the familiar trappings of anxiety creep up, and I make the effort to step away if I can, breathe and take a break. I’m also trying to take more time where I can – when I walk the dog with Millie for example, I’m trying not to rush her along as much, we take as long as it takes (!) for her to look at flowers and grass and whatever else, run in the opposite direction or sit on the floor. I’m taking more time to enjoy little things and just say hi to people where I might have stomped on past before, especially at work. Like a Queen (Constance Hall): this is a particularly empowering book for women, all about Constance’s thoughts and experiences about mental health, children, relationships, feminism, and life in general. Towards the end of the book I started to really get a lot of what she’d been saying about where you get your strength and value from as a person and it just resonated with me. She’s very outspoken and honest, which I found very supportive, in an odd way. The life-changing magic of not giving a f@*k (Sarah Knight): this book does exactly what it says on the cover – gives you a long lecture about letting go of worrying about everyone and everything else, and giving too many fucks. I read it in only four days, and there are some processes for evaluating where you give too many fucks and reducing that which I haven’t done yet, but the overall philosophy is a great one and I’m definitely trying to give fewer fucks now! Music: Now and again when I’m alone I absolutely love to put music on really loud and sing or dance around to it – always releases endorphins and cheers me up. Some of my faves (don’t judge me!) are Little Mix (girl power to the max), Adele or Westlife for a good old singalong and some 90s RnB for a little bop. You app: I only discovered this a few weeks ago, and I love it. It’s all based on the idea that making positive changes in your life is about making a series of micro changes first. You select subject areas you want to focus on, and then every day the app sets you a micro action to complete, one of mine this week was to eat outside and enjoy the sunshine. Just a little something every day to make you stop and enjoy the moment! Putting my daughter in nursery: Millie’s always done two days a week in nursery, and while I was off I continued the pattern, which was invaluable. I never got two days a week to myself, but it just allowed me to shift my focus and recharge my brain regularly,and I’m very glad I had the luxury to do that. Time away: This one is also a luxury that I’m grateful for. In the few weeks before i came back to work my husband and I went away with family, we were lucky to enjoy some good weather and had a truly fantastic time with some of my family, and then his sister and her children. 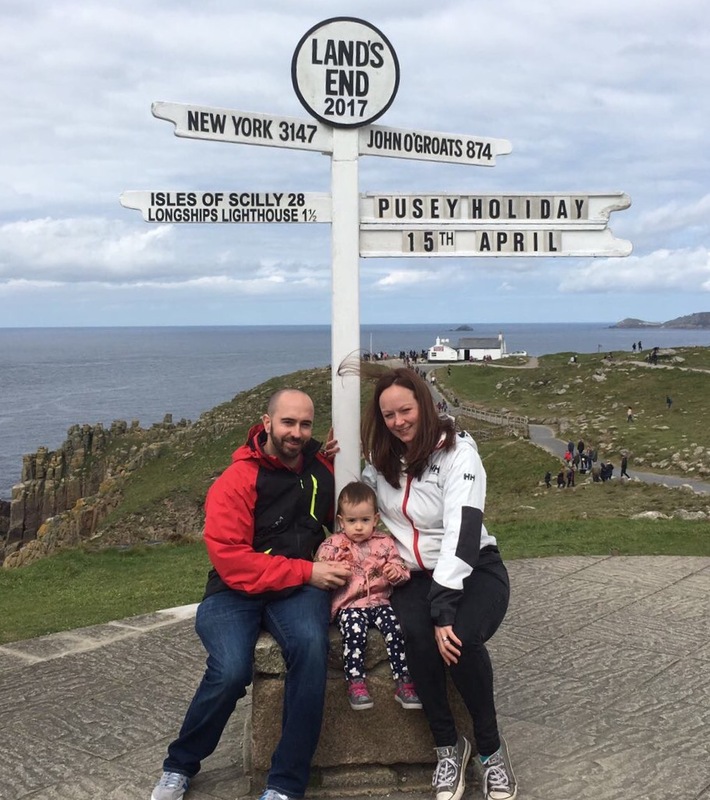 Being away from home gave us both proper headspace and meant we spent true quality time as a family (standard Land’s End photo below), which left me feeling so very good about my life, and more determined than ever to be more appreciative of the good stuff and not get dragged down by the bad. This has been a very long and rambly post. When I read it back it sounds rather floaty and wonderful and actually the reality isn’t that perfect. I can’t say that I’ll never struggle in the same way again, and I certainly still have times when I’m overwhelmed and get totally drained, I don’t have time to amble where I’d like to or I snap when I’d rather I didn’t, but it’s a work in progress. The bottom line is I don’t feel like I’m anywhere near the dark place I was in at the beginning of the year, so I must be doing something right!